The highlight of this week has been the arrival in my son's home of Mishka (see above). 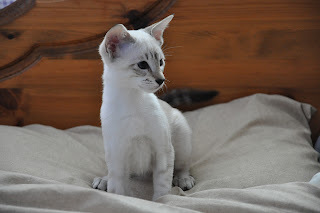 She is a 13-week tabby-point Siamese kitten, but as her favourite game is 'fetch' with a fluffy ball and her preferred pastime is hurling herself up and down stairs while barking at full volume, I sense there is some confusion in that triangular little head of hers as to whether she is a cat or a dog! The highlight of this month - and a great start to 2011 - is that The Jewel of St Petersburg has been longlisted for the RNA's Historical Novel of the Year Award, as well as its prestigious Romantic Novel of the Year Award. The shortlist will be announced in the splendour of the RAF Club in Piccadilly, London on Feb 10th. So watch this space. And the lowlights? Still struggling with the end of The White Pearl. Endings are tough. I have some theories about this but will save them for a later post, as when I get started on discussing the pitfalls that lie in wait for a writer there is a distinct danger that there is no off-button! I was recently asked by one delightful but misguided reader if I would offer him some thoughts and insights about writing. No reader should invite an author to hold forth about their thoughts and insights unless they are prepared to sit up all night listening! Writers are consumed by their characters and their stories - it's the only way they can ever get to the end of a book - and though writers try to look and act like normal people, their heads are seething with another life and another place. They sit smiling at you and nodding in the right places but don't be fooled! They learn to be cunning, so that you do not guess that their minds are far away, battling with the blank page that awaits them like a nemesis from their subconscious. Maybe I'll get to the end of my current book faster if I learn from the kitten. Whatever lurks in the underworld of my mind needs to get out - even if it comes out as strange barks. CONGRATULATIONS! I adored The Jewel of St Petersburg, it's a brilliant book and taught me so much I didn't know about Russia and that period of turmoil. It definitely deserves to win the RNA awards. I love historical novels and I have never read a better one. Good luck. Thanks for the vote of confidence. Since falling in love with Russia myself and learning about my own family's involvement with it, I feel compelled to entice others to discover more about that country's amazing history. Through the stories in my book I want them to understand what drove its people to the excesses that took place in the twentieth century. So if an RNA Award can help spread the word, I'm cool with that. I love all of your books. I can't stop turning the pages to find out more. You are a spectacular writer, and I am looking forward to many more of your books. Good luck with the RNA's Historical and Romantic Novel of the Year Awards. What a great start to the new year! The Jewel would get my vote...Best book of yours and of the years! Comments like yours start my day on a upward curve! Thank you. I certainly intend to keep writing, so you will have plenty more pages to turn. My next one, The White Pearl, is a step into new territory but I hope you'll find it just as enticing. I am off to London for the RNA Awards Shortlist tomorrow but when I'm back I shall post some info on what drove me to write The White Pearl.